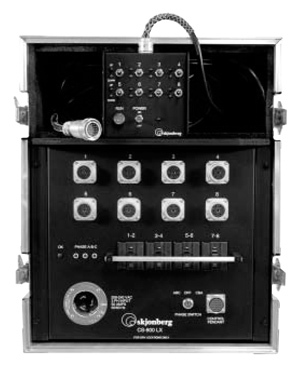 The CS-800LX is the single plug version of our popular CS-800 hoist relay control. Hoists running through 7 pin Socapex, 7 pin Litton Veam or 14 pin Cannon use the CS-800LX. This model has the same versatility and function as the CS-800. Eight chain motors can be run individually or in unison. Both power distribution and relay control for the hoists reside in the same compact unit. The basic design runs 3 phase motors at 208V-220V. The 50 amp input provides adequate current to run 8 lhp motors. Each of the 4 circuit breakers protects 2 motors.